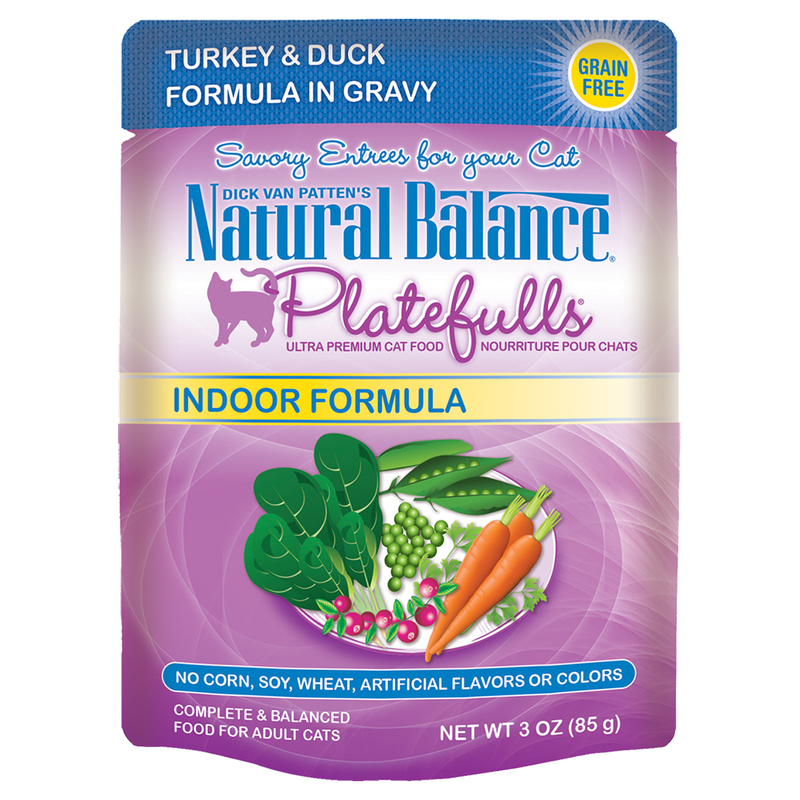 Treat your kitty to a plateful of goodness in every bowl with the Natural Balance Platefulls Indoor Formula Duck, Chicken & Pumpkin Formula in Gravy Grain-Free Cat Food Pouches. Made especially for kitties with gourmet tastes, it features duck and chicken as the top ingredients for all the protein your pal needs to thrive—not to mention the irresistible flavor that’ll have him running to his bowl every time. It’s made with fiber-rich pumpkin, wholesome veggies for a boost of antioxidants in every juicy bite, and real broth so it supports urinary health and keeps your kitty hydrated. Since it’s fortified with vitamins, minerals and essential taurine, it makes a complete and balanced diet for adult cats. Plus, it has zero grains or anything artificial. Because foodie or not, he’s a carnivore at heart. 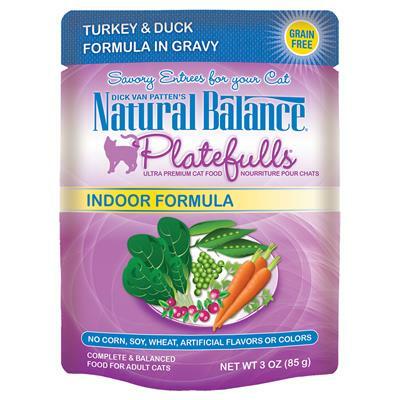 Gourmet, grain-free wet food features high-protein duck and chicken as the top ingredients. Loaded with wholesome veggies like pumpkin, peas and alfalfa, and provides a 100% complete and balanced diet for adult cats. Packed with limited carbohydrate sources for highly-digestible energy, and balanced omega-3 and 6 fatty acids for a healthy skin and coat. Packed with pride in the USA and made with zero grains, corn, soy, wheat, artificial flavors, colors or bleached ingredients. Chicken Broth, Duck, Chicken, Chicken Liver, Carrots, Pumpkin, Peas, Dried Egg Whites, Ground Dried Peas, Natural Flavor, Potato Starch, Ground Flaxseed, Guar Gum, Dehydrated Alfalfa Meal, Dried Beet Pulp, Salmon Oil (Preserved with Mixed Tocopherols), Potassium Chloride, Sodium Acid Pyrophosphate, Tetrasodium Pyrophosphate, Minerals (Iron Proteinate, Zinc Proteinate, Copper Proteinate, Manganese Proteinate, Potassium Iodide, Sodium Selenite), Cranberries, Sodium Carbonate, Vitamins (Vitamin E Supplement, Thiamine Mononitrate, Niacin, D-Calcium Pantothenate, Vitamin D3 Supplement, Pyridoxine Hydrochloride, Riboflavin Supplement, Vitamin A Supplement, Vitamin B12 Supplement, Folic Acid, Biotin), Taurine, Spinach, Parsley, Dried Kelp, Choline Chloride, Sodium Phosphate, Sodium Hexametaphosphate, Dl-Methionine, Yucca Schidigera Extract, Rosemary Extract.